E-Prime allows users to import a text file (i.e., .txt file) via the List object. Word files (e.g., .doc, .rtf files) are not supported. 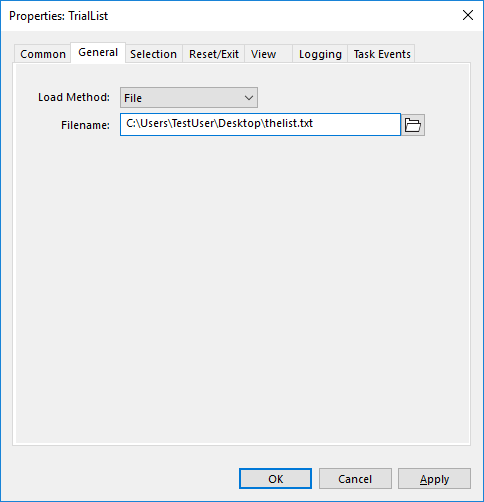 By setting the Load Method property of the List to "file" and the FileName property accordingly (i.e., to the imported .txt file), a tab delimited text file can be loaded in an experiment. All text files imported into E-Prime via the List object must be tab delimited and in accordance with the settings of the List object itself. In the text file, the Weight, Procedure, and Nesting attributes must be specified along with the Stimuli that are presented. Essentially, the text file should be a "mirror" of the List object itself. Each attribute should be separated by a tab. A tab in a .txt file moves to another column in the List Object, whereas a carriage return moves to the next row. No extraneous spaces should exist before or after each tab or value entered into the text file. Additionally, the first row of the text file must list the attribute headers (i.e., Weight, Procedure, etc.) for each column. These headers need to be included within the file or it will not be readable by E-Prime. Use any type of word processing software such as Notepad or Microsoft Word. Save the file with a .txt extension. Include each attribute (i.e., Weight, Procedure and Nested) in the text file even if an attribute does not include any variables. Separate each attribute with a tab. NOTE: Nested values are blank in the image above. X and Y values correspond to "Stimulus." Select the List Object in the Structure. Set the LoadMethod to "File". Set the Filename to the name of the .txt file that should be imported. NOTE: Importing .txt files can be somewhat cumbersome because E-Prime is picky about the formatting of the file. Be sure to follow the above steps and guidelines when using the File Load Method. 3/3/2012 22:44 I followed your instructions exactly, and cannot import a text file with my stimuli. I ensured that it had Windows line-breaks, was UTF-8 encrypted, and included all of the header information. I then tried to import your "example" text document above (which is actually SPACE delimited), and tried to both import it as is, or with tabs, and neither case worked. Could you please include a document that can be read in as a list? And can you describe whether we need to add rows and columns to the list before the file is imported? I cannot get this to work in the GUI nor in E-Basic. 9/18/2012 13:37 I followed the steps here. But, nothing shows up in my list. Anyway, to check and see what is wrong? 12/17/2014 5:11 Is it possible to load only parts of a text file into an e-prime list? For example, I would like to load only 3 trials (i.e. lines) at a time.